First things first… Merry Christmas Eve! 🙂 I hope you are all enjoying time with your loved ones. I’ll be going over to my sister-in-law’s house tonight and tomorrow for festivities, and I’m looking forward to it! 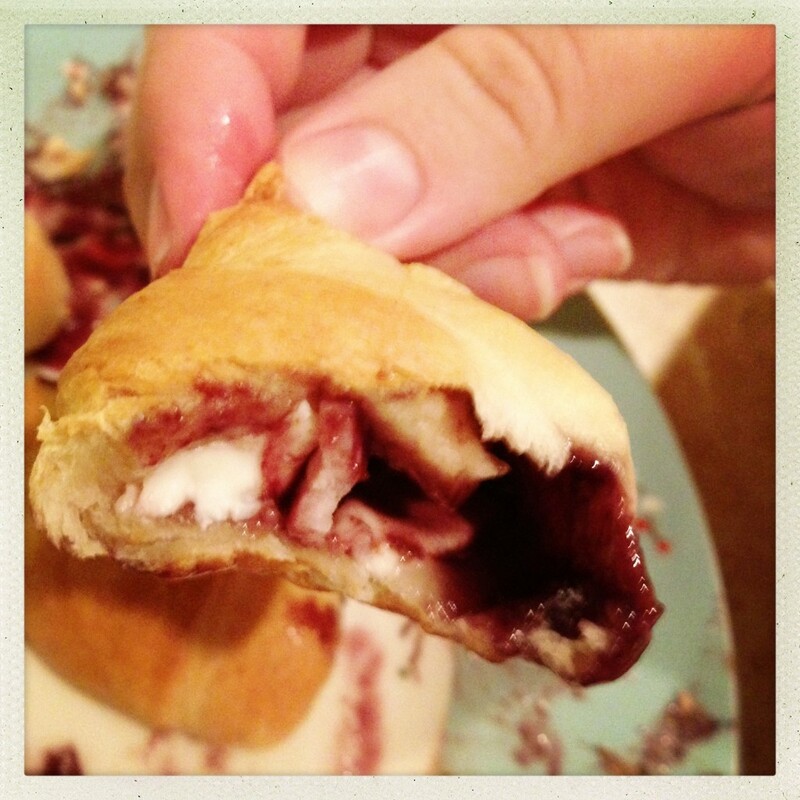 I haven’t posted a recipe in awhile, I know I have been neglecting my poor little blog. And I know that I often don’t include a photo with my recipes, because I don’t always think to take a picture until it’s halfway eaten AND, if I do take a photo before I happen to eat it, it’s just my luck that it’s dark out so the lighting is terrible AND the photo ends up blurry because I am taking it on my phone and not taking too great of care. I promise I am a somewhat better (OK, OK, I’m still an amature photographer) at taking photos than this… but I am usually too lazy to take out my really old 6MP DSLR camera. My iPhone CAN take good photos, but sadly, these are lacking. At least I tried to put them on a pretty plate for you, so give me some props for that at least! Anyway, on to the food, shall we? If you’re like me, you have a massive sweet tooth (which is why you try and avoid having a lot of sweets in your house). Anything is better if it’s a little sweet, right? That’s why I love onions and ham and bacon a lot, because they go so well with a little sugar or fruit, amirite? So it goes without saying that I LOVE Monte Cristo sandwiches. What’s not to like? Ham, cheese, dipped in a sweet batter, fried with powdered sugar on top and dipped in JAM??? Sign me up!!! The only problem is that deep frying is a bit too heavy for me. Fried foods and I don’t mix very well. I also like things to be very easy to make, otherwise I tend to NOT make them unless I am feeling particularly foodie that day. I’m sure you could make these fancier by using different cheeses, homemade dough and whatnot. Despite what I just said about making things easy, I am also a walking contradiction because I also like to make fancy things. So I would definitely be the person mixing several different cheeses together, adding spices or maybe some sweet mustard to the mix, and then pitting fresh cherries and sauteing them with sugar a bit instead of jam… but seriously. The easy route is very basic, and you can always get fancier if you’re up to it. Seriously, this is it. And I usually have all of this in the house at any given time which means… I can have them whenever I want!! Spread cream cheese on ham slice, and spoon a little jam on top of that. 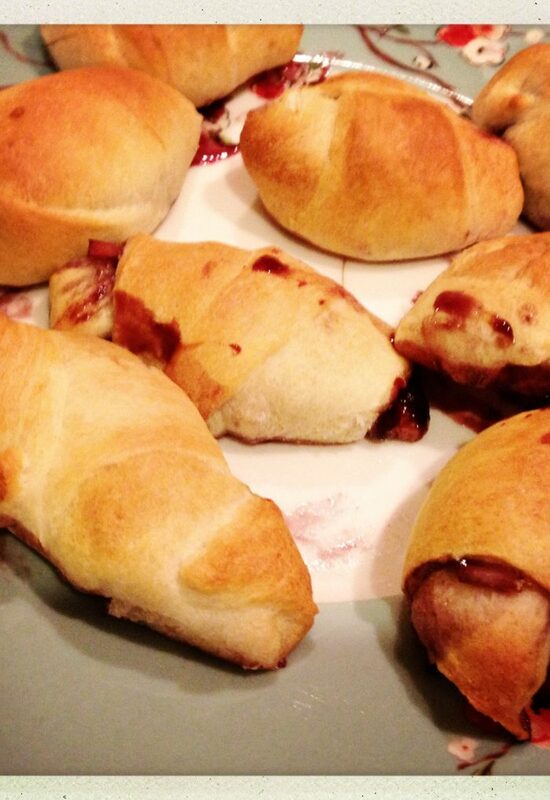 Roll up with a crescent roll. Make sure the ends are sealed up as much as possible. Bake for 15-20 minutes or until the tops a slightly golden brown. Contain yourself for a few minutes until they have cooled down enough to eat. I made these as an appetizer, but then proceeded to spoil my dinner by eating about 3 of them in 3 minutes. I have a church potluck next Sunday, and I think I’m going to make a batch or two of these. I love to bring something that’s no-fuss — that, and there is usually about a 1:1 ratio for sweets and savory items. The people at my church do NOT mess around with their desserts. For some people, the aspect of making risotto is scary and can be difficult to master. Not only that, but it requires constant supervision for a long time, making it a difficult choice for a weeknight dinner. However, this abbreviated version takes out the guesswork by using ready to eat rice or farro and a reduced amount of liquids. Feel free to adjust this recipe to your own tastes by what meat (or sans-meat), vegetables and spices you use! Note: Keep in mind my ingredient measurements here are approximate… I am a pinch of this pinch of that cook so if something looks too little or too much, adjust accordingly. Thank you! In a small saucepan combine 2tsp of Better than Bouillon, water and wine and bring to a light boil. Once boiling reduce heat and keep warm. In a large skillet, melt 2 pats or so of butter and saute your chicken with sea salt until cooked and internal temperature reaches 160 degrees, about 8 minutes. Remove from pan and reserve. In the same pan, melt some more butter and saute the onion until translucent, about 5-7 minutes. Add a ladle full of broth and cook until the liquid evaporates. Add your other vegetables to the pan along with more of your broth mixture. Stir frequently and keep adding broth as it reduces. Reserve approx ½ cup. Once vegetables are fully cooked and the liquids have been reduced, approximately 5-10 minutes, add the remaining liquid and Farro to the skillet. After liquids have reduced some, stir in the cheese and heavy cream. Add all of your spices, and stir thoroughly. I did this about three times. On all of the spices, I used onion powder the most liberally, then salt, and only a pinch of nutmeg, paprika and thyme. 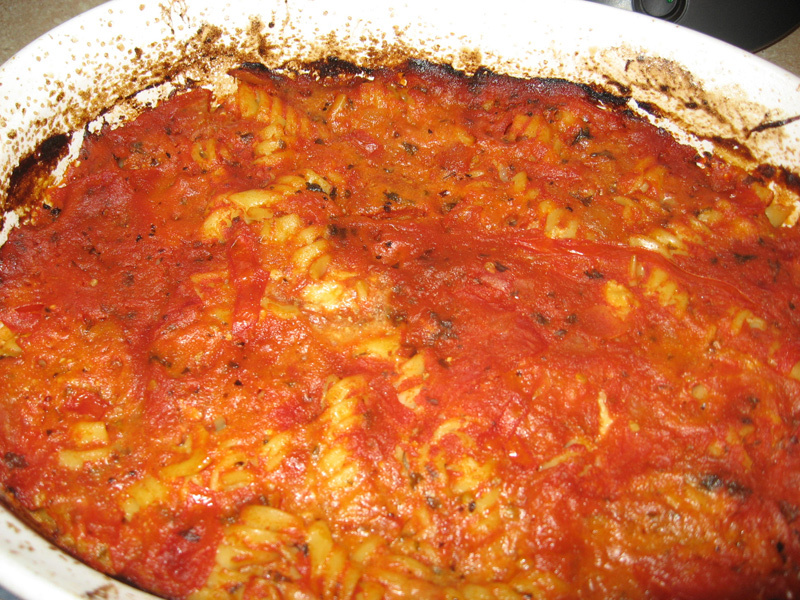 Turn off the burner, and allow to cool and thicken for a few minutes before serving! This easy recipe will make 2 8×8 dishes, each of which is enough to serve 4-6 people, which means it’s easy to make one for dinner tonight, and stash the other in the freezer for an even easier dinner later. This is a recipe that I know by heart; it’s so simple that I think you will too! It’s also great to make for potlucks, entertaining guests, or like I just did: make for new parents so they can focus on feeding the baby every 2-3 hours and not worry about feeding themselves. Shred the chilled rotisserie chicken and remove skin/bones. Cut or rip into bit size pieces. Mix together 1/2 can of enchilada sauce, re-friend beans, 1/2 can of green chilies, salsa, garlic and cilantro, to taste and combine with chicken. Prepare an 8×8″ square or round pan with non-stick cooking spray. Start with some enchilada sauce, followed by a tortilla, the chicken filling, sprinkling of cheese, a little more enchilada sauce, and then start again with a tortilla and so on. You should be able to fit 2 layers with the filling. On top of the last tortilla pour on your remaining enchilada sauce, sprinkle with the rest of your cheese, tomatoes, green onions and sprinkle additional cilantro. Bake in the oven for 20-30 minutes. A refrigerated or frozen casserole will take longer to heat through, so adjust your cooking time as necessary. The cheese should be melted with the top slightly browned. Cut into 6 pieces and serve hot with sour cream on top. Enjoy! Prepare the rice as specified on the package. Drain the corn and mix into the rice with the green chilies. Top with cheese, which should melt. If not, you can pop it in the microwave for a few seconds. Serve hot with sour cream on top. Enjoy! I’m writing this on the day of Christmas eve, listening to Hanson’s Snowed in , because it doesn’t quite feel like Christmas without it, after I just frosted 2 dozen cupcakes. 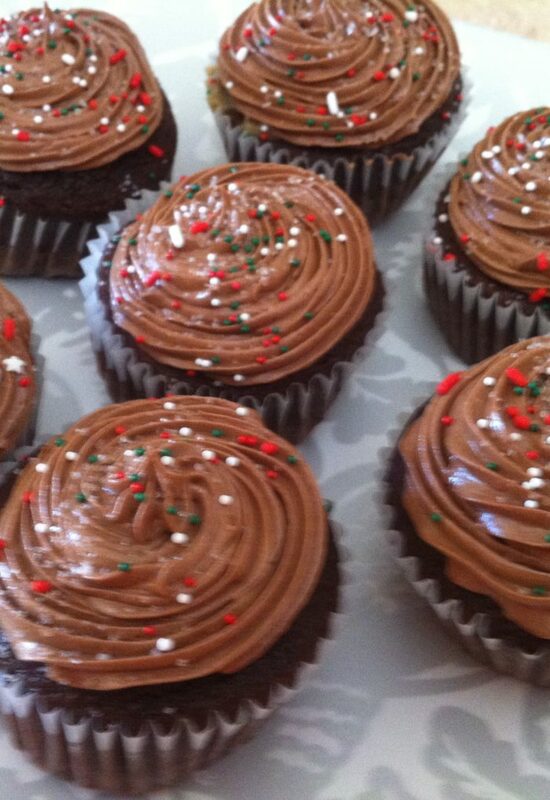 They aren’t just any cupcakes, they are caramel filled chocolate cupcakes with milk chocolate frosting, festive sprinkles and a hint of sea salt. It’s a mouthful to say, but every last entirely homemade crumb is a delicacy. And since this is the Christmas season where the theme is about giving to others, I am going to share my recipe with you. I have been told that these are the best cupcakes ever, but I suppose you will just have to try them and see! To give you an idea of what you’ll be making, think of an incredibly moist cake, with caramel sauce with an ooey gooey center, topped with creamy chocolate icing and a hint of salt to enhance the sweetness. Preheat oven to 350 & line muffin tins with cupcake liners. Beat eggs with an electric mixer until they are pale yellow and frothy, and then add in sugar and vanilla. Blend milk, sour cream, melted butter and chocolate. Sift together cake flour, cocoa powder, salt, baking soda and baking powder, then slowly blend into wet mixture. If you’re lazy like me and don’t want to dirty too many bowls, add the cocoa powder first, then start adding in the flour one up at a time. Finish up with the salt, baking powder and baking soda. They key with a hand mixer is to incorporate slowly otherwise you’ll have a cloud of flour dust. Once your mixture is light and thoroughly mixed, use an ice cream scoop to fill up your cupcake liners 2/3. In my oven, 15 minutes is perfect, but every oven is different. On the first batch, put them in for 8 minutes, and keep popping them for an additional 2 minutes before checking them again. If the toothpick comes out clean, then they are done. Remember how long it took for them to bake, and that’s your magic cupcake number! In a medium sauce pan, mix sweet and condensed milk and brown sugar. Stir until the sugar has dissolved completely. Add melted butter and additional milk. Continue stirring until mixture is smooth and creamy. Allow 3-5 minutes to thicken. Pour into a bowl & cover. For 24 cupcakes, this amount of caramel sauce will be far more than necessary. I recommend freezing leftovers into multiple containers so you can re-use on multiple occasions. It also makes a wonderful ice cream topper, and can be used in other desserts. Make sure any un-used portion of the sauce is at least refrigerated. Add cocoa powder, melted chocolate, salt and vanilla. Slowly add powdered sugar 1 cup at a time until fully blended. The mixture will get very thick. Add 1/2 cup whipping cream, or more as needed. I often just eyeball this stage without measuring. Frosting should be light and fluffy when finished. Note: since this frosting is made with butter instead of shortening, it will harden in the fridge. If you are not assembling your cupcakes right away, refrigerate the frosting. 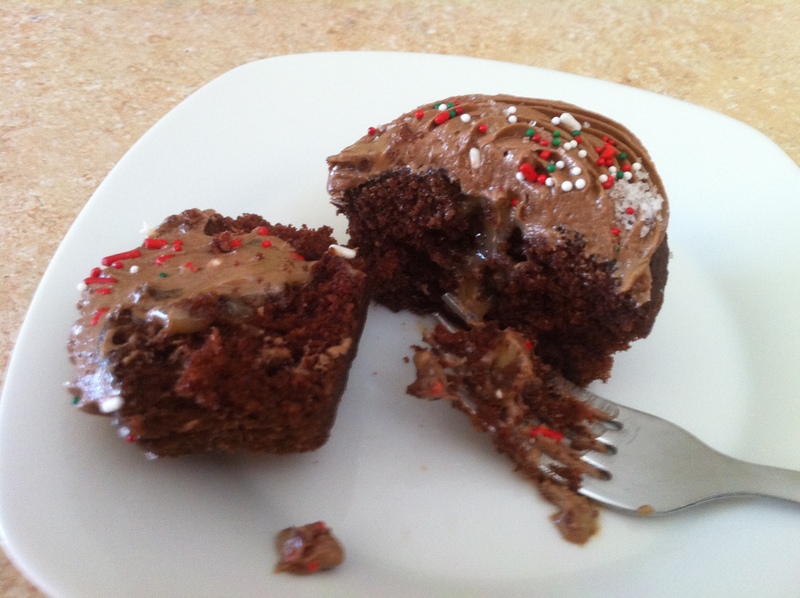 When you are ready soften for 30 – 90 seconds using a low or medium power in the microwave, but be careful because you do not want to MELT the frosting. Or, you can take it out well in advance to icing your cupcakes and allow it to come to room temperature. This is by no means the only way to assemble the cupcakes, it’s just how I do it. You will need icing bags, couplers, and tips. I use a round tip for filling, although after some research online, the recommended tip for the job is made specifically for this purpose: WILTON ROUND TIP #230 402-230, and a star tip for my frosting. With a sharp knife, poke the center of the cupcake and twist the blade around to give a small round hole for the filling. Set up an icing bag with your round tip and fill it 2/3 with caramel filling. Be careful, as the filling WILL run out of the other end. Twist the end of the bag, and quickly insert the tip into the hole you made in the center of each cupcake. 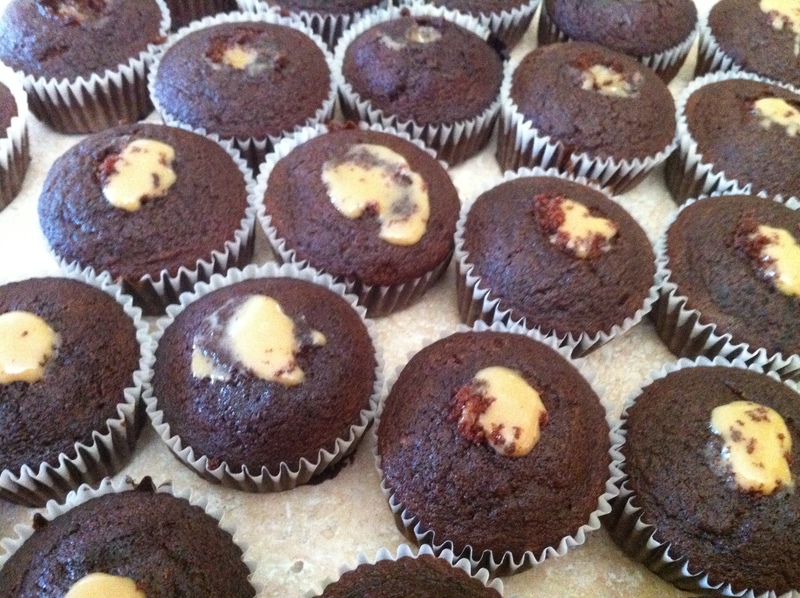 Push it far into the cupcake and gentle squeeze the caramel into the cupcake while lifting up. Stop squeezing, turn so the tip is facing up, and then go to the next. You may need to refill several times. Do the same thing with your frosting with the star tip, and starting from the outer rip of the cupcake, swirl to the center, building up each time around until you have a higher center, and break. It may take some practice, but you’ll get nice fat swirls and a nice little ending point. Open your sea salt grinder, and give it a shake in your sink to make sure there isn’t any build up of salt. Grind it once or twice. Now, grind once on each cupcake. It should only be a small dusting, do NOT go overboard with the salt. Generously sprinkle with… sprinkles! I recommend choosing bright colors that will contrast well with the dark chocolate. Another original recipe by yours truly! I used my own homemade teriyaki sauce as well, which I should post the recipe for soon. Against my better judgment and roaring hunger, I did not take a photo of this dish before digging in… but my husband has declared this one a “keeper” so I will be making it again. Before continuing I would just like to add that I have never been a huge fan of coconut, but in certain dishes and desserts I find it positively delish. Thaw the shrimp in a bowl of cold water. In a medium saucepan, combine 1/2 can of coconut milk, 1 cup of water, 1 tsp of sugar and a pinch of salt, stir. When the sugar is dissolved, add 2 cups of jasmine rice and turn the heat on high. Once the water begins to boil, reduce heat, cover and let simmer for 12 minutes or until the rice is tender. Place rice in a serving dish and sprinkle with cilantro and shredded coconut. Create your coconut curry sauce by combining the remaining 1/2 can of coconut milk, minced garlic, curry powder, cilantro, shredded coconut, teriyaki sauce and brown sugar. Mix thoroughly. Begin sauteing peppers and onions on medium-high heat with vegetable oil. Add your coconut curry sauce to the dish, reserving some for cooking the shrimp. 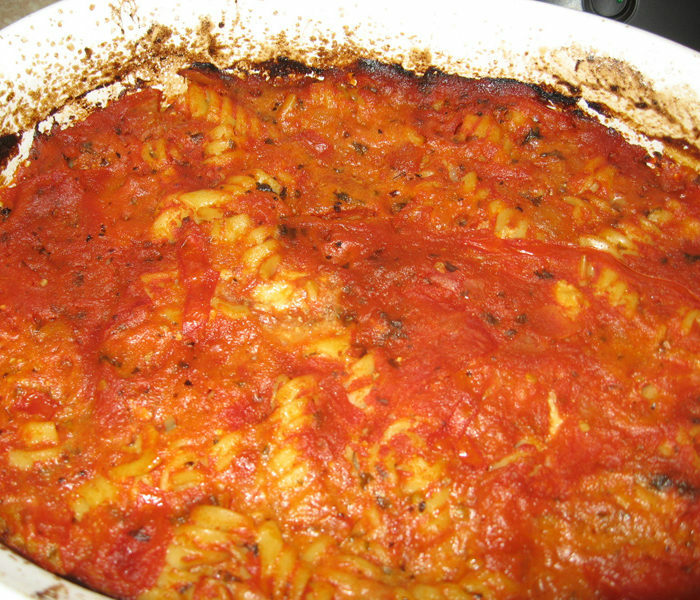 Cook until sauce has reduced and thickened slightly. Remove peppers and onions from pan. Add remaining coconut curry sauce and sautee shrimp until thoroughly heated (approximately 2 minutes). If you used pre-cooked shrimp, then they should just curl up some. If you are using uncooked shrimp, sautee for about 4-5 minutes or until pink. Now Mac & Cheese is all grown up! I am a big fan of Macaroni & Cheese. The oozy, cheesy goodness… what’s not to love? Well, apparently some people don’t care for the oozy, cheesy goodness and would probably alter the statement to the tune of “what’s not to hate?” Yep, that’s right. John doesn’t care for Mac & Cheese the way most of you think of it. He likes a version his mother makes often during the holidays that is light on cheddar cheese, but heavy on tomato. Now, considering myself quite a connoisseur of Mac & Cheese, I liked his mom’s version okay, but to be perfectly honest with you, it was a little bland and not nearly enough cheese for my taste. I made these up for some house guests on a whim and they were a big hit! I thought I would share my recipe with you all. Rinse mushrooms and remove stems. Discard stems, or use for something else — I cut some of them up and sauteed them for a brown rice dish I was making. Brush oil on your backing dish of choice, and brush mushrooms front and back with oil. Set aside. Prepare bacon slices in the microwave, chop when cool. Saute chopped onions in olive oil, Worcestershire and red wine, to taste. Mix Alouette or cream cheese, heavy cream, mayo, mustard, breadcrumbs, sauteed onions, bacon, garlic powder, sea salt and parsley. Stuff mushrooms with filling, top with pieces of swiss cheese, and parsley. Bake in preheated oven for 30 minutes, or until the mushrooms are soft and the cheese is lightly browned. Allow to cool a few minutes before serving. I created this recipe on a whim yesterday… it was a cosmic accident. 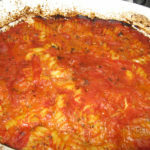 John had just made some lovely homemade tomato sauce, I had 3 different colored peppers in the refrigerator that needed to be used, and a pound of turkey in the freezer. Voila! 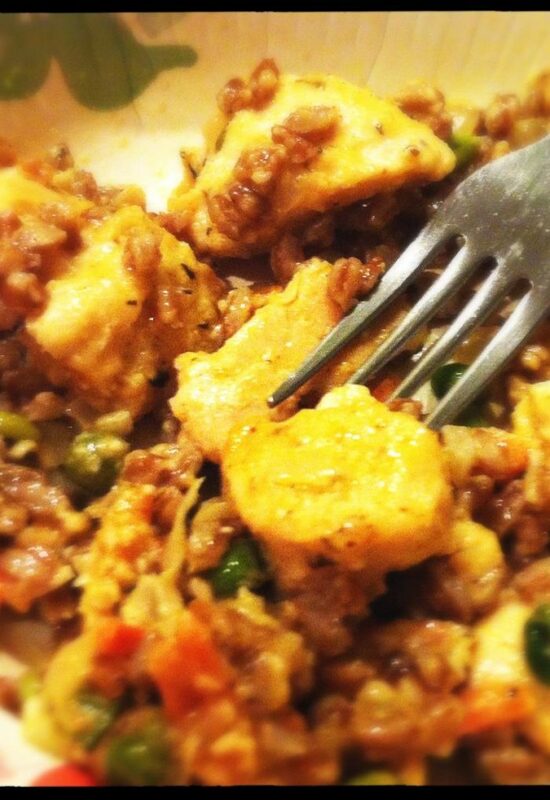 These got rave reviews from my husband and mother in law… they said it didn’t even taste like turkey. So you GOTTA try it! 🙂 By the way, if you aren’t a huge fan of green peppers, try some of the other colors as they tend to be a little sweeter. Again, terrible with the pictures. I need to start taking pictures right after I make it! I made this salad with my BBQ pizza recipe, and it complimented the meal quite well, picking up from the sweetness of the BBQ sauce. Get ready. This is a complicated salad to make. Take a deep breath. This completes step one. If your strawberries are not sliced, nor your onions chopped, make it so! Jean-Luc Picard commands it. Mix together the lettuce, strawberries, golden raisins, pecans, cherry tomatoes, and chopped red onions together. Crumble the cheese on top. Optional: if you don’t plan on having any left overs, mix in the dressing. Otherwise mix it on your individual plates. Sorry about the lack of a picture. I was so hungry that I didn’t even think about getting a picture until after it was demolished. Next time! Once upon a time there was a Nick-n-Willy’s pizza place near my old apartment that has since closed down. They had the best BBQ pizza that I had ever had, and when the closed I was very sad. However, it is a happy day because I have perfected my recipe and have now moved the “best ever” to my creation! And now I shall share my knowledge of BBQ pizza with you lucky souls :). I also made this salad to accompany it. Slice chicken and sautee with olive oil until done (approx 10 – 12 minutes). Roll out pizza dough onto a lightly oiled pizza stone (or cookie sheet). Brush top with olive oil and poke with fork. Put into oven for 10 minutes, so dough begins to bake. Assemble pizza by spreading barbecue sauce, as desired, on the pizza crust, then top with cheese, generous serving of cilantro, cheese, red onions and lastly, chicken. Bake for another 20 minutes, take out and allow to cool a few minutes before slicing.